Late last week America reveled in two traditions. One being an age-old controversy and the other being a relatively new one. Thanksgiving came with its usual gusto of Holiday sales, Black Friday stampeders, Turduckens and the ever odd Presidential pardon of a turkey. As an ever busy and weary President Obama smiled at the absurdity of wasting his precious time pardoning a fowl, his children Sasha and Malia were unable to hide their boredom [at least they weren’t on their smartphones]. The girls exhibited regular teenage behaviour, side glances and smiles at each other and a look of disinterest throughout. However that is where the innocence ends. In this day and age of rampant opinion and the Wild West internet it wasn’t long before grown people started hurling insults at the two teen girls, in true Thanksgiving fashion. After all this is a holiday veiled in false premises of togetherness and celebration to hide its true nature of genocide, lies and betrayal. 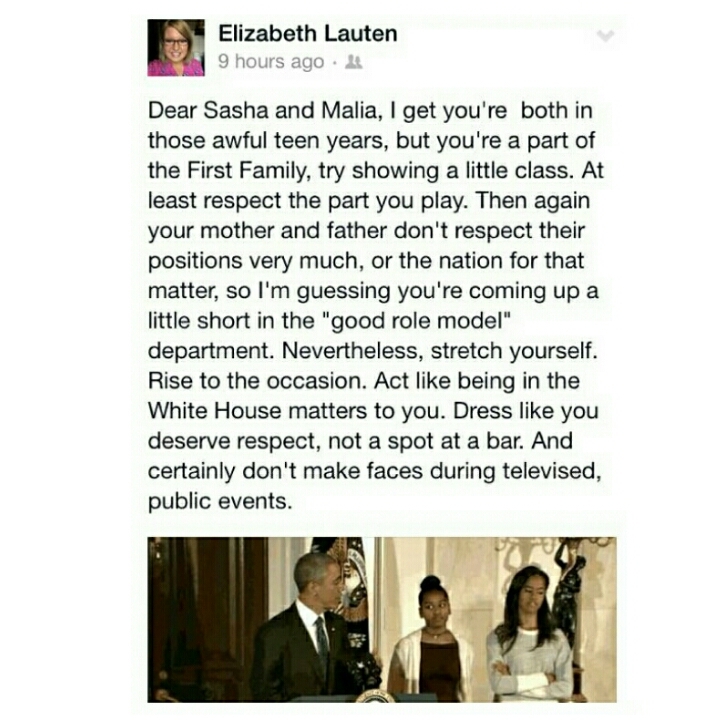 Elizabeth Lauten, an aide to a Republican Congressman took to Facebook to chastise the First Children and comment on the way they are being raised. As a communications officer her comments weren’t only bizarre, they were incendiary as social media lit up with users both defending the girls and others defending Lauten. Many pointing to Lauten’s freedom of speech as a defense for her ill thought out, unwarranted critiques of children, because lets face it, Sasha and Malia, 13 and 16 years of age respectively, are children. But that didn’t faze Lauten or stop her from accusing them of being dressed “for the bar”, having no class and lastly, and most problematic of all, lacking “good role models.” As a mother of two teenage girls [the exact same age as President Obama’s daughters] I know how hard it is to get them to agree on an activity or enjoy each others time. I am also pretty sure that a celebration of a turkey would rate pretty low on their excitement list. But to insinuate that the POTUS and FLOTUS are doing less than a stellar job at raising these two lovely girls is absurd. Their father is the most powerful, black man in the free world, period. Their mother an Ivy League educated lawyer. How are they not the best possible role models any child could have, especially black ones. But all this hoopla over Sasha and Malia reminded me of young Quevenzhané Wallis and her run in with The Onion, the satirical news site. Young Quevenzhané was nominated for an Academy Award in 2012 after her breakout role in Beasts of the Southern Wild. The story should have been how she was the youngest person ever nominated for an Oscar, however The Onion in search of online clicks ran a story calling the then nine-year old the C word for constantly reminding reporters and interviewers of the correct pronunciation of her name. This brings us to the new tradition I was talking about, when we allow children [usually those of colour] to be attacked via the internet. Quevenzhané now the tender age of 11 is a pro at dodging internet hate. after receiving the lead role in the reboot of Annie social media erupted in disdain. Users demanded to know why [white] Annie was now being cast as a “nappy headed N****” one user went as far to say that it was tantamount to Martin Luther King jr. being played by a white man. Despite Annie being a fictional character from an 80’s musical and Dr. King being the cornerstone of the Civil rights movement, but ya they are the same thing. [A rundown of the tweets can be viewed here] But the real question is why are we allowing internet trolls to verbally eviscerate our brightest of tiny stars? Elizabeth Lauten issued a haphazard apology later that night via her now privatized Facebook page. However it was too little, too late and Lauten has since resigned her position. I am not sure if her ultimate goal was to be unemployed, I lean towards the though that it probably wasn’t. she was probably trying to drum up similar sentiments from other GOP aides and officials. I urge Lauten in her now abundant spare time to take some teenage girls to an equally exciting event, like the ground-hog checking for his shadow on February 2 and when they get bored have her berate them with words like ‘class’ and ‘role model’. Sounds fun. But the question still remains why would a prominent political aide stoop to such nasty vitriol? The internet offers anonymity and protection which allows many to voice their deepest, darkest opinions while others post in hopes of creating a powder keg that they will happily watch explode from the comforts of their living rooms. The fallacy of the internet is that it makes everyone feel like they are an arm-chair expert of some kind and entitled to voice their opinion endlessly with no repercussions. The internet once called the ‘information super highway’ has been reduced to a cacophonous traffic jam where everyone scream their opinion like a honking horn while plugging their ears. So while some of us question the role models children have, it is up to the rest of us to embody the values and qualities we want our children to reflect. This entry was posted in Media, opinion and tagged Annie, Elizabeth Lauten, FLOTUS, Georgia Williams, Internet trolls, POTUS, Quevenzhane Wallis, Sasha and Malia, The Onion, Toronto, Turkey Pardon, Tweets. Bookmark the permalink.